THE DOCTOR NO LONGER EXISTS! Doctor Who, and all of his regenerations, have been taken out of time and placed into the Death Zone. In the words of the Doctor's best enemy, The Master, "A cosmos without the Doctor scarcely bears thinking about." And it is up to the evil Master himself to rescue The Five Doctors and save their home world of Gallifrey! 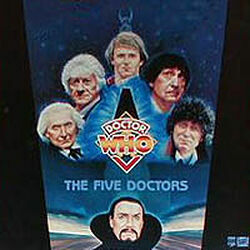 "The Five Doctors" is a grand one-time-only union of the first Five Doctors, as well as a reunion of all their most famous friends, foes and monsters. Originally created to celebrate the 20th Anniversary of Doctor Who in 1983, this now legendary 90-minute special is both an ideal introduction to broadcast history's longest-running science fiction series, and a fan's fantasy come true.